Ann Duncan is a nature and travel photographer living in Boulder, Colorado. Since forming her company Synergraphics in 1976, she has shot both stock and assignment work for a diversity of editorial and commercial clients. She now shoots only stock, focusing primarily on the Colorado tourism business. 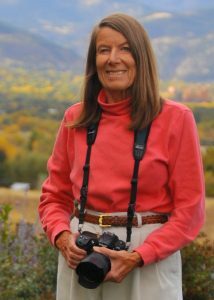 Passionate about the outdoors since childhood, Ann frequently travels throughout Colorado and the Rocky Mountain West, exploring and hiking in search of evocative images for calendars, cards, magazines and web sites. She loves the excitement of discovering a new location and capturing its unique beauty. Known for her crisp, colorful, flower-filled landscapes, Ann is persistent about waiting for the right conditions. When the light, wind, clouds and flowers cooperate for the camera, it is always a magical experience. She occasionally donates her work to nonprofit conservation groups such as Colorado Conservation Trust, Colorado Native Plant Society, and Rocky Mountain Nature Association to help protect wild places and their natural resources. She especially enjoys working with the City of Boulder’s Open Space and Mountain Parks department. Ann has also enjoyed extensive international travel, and is particularly fascinated by the primitive, traditional cultures found in such Third World countries as Ghana, Guinea, India, Mali, Micronesia, Myanmar, and Papua New Guinea. In addition to her nature and travel work, Ann has found a niche in environmental subjects, such as garbage, recycling, solar and wind power, plus the many negative issues experienced by much of the world: climate change, drought, pollution, and overdevelopment . The Earth faces many environmental challenges, and Ann wants to raise an awareness of these issues through her photography. Ann is a past member of the Professional Photographers of Boulder County and a current member of the North American Nature Photographers Association. Her stock work is represented by Viesti Associates. Ann’s publishing credits and commercial clients include Backpacker, Boulder Chamber of Commerce, Boulder Magazine, The Boulder Reporter, Fodor’s, Frommer’s, H2Logos, Money Magazine, National Geographic, Re/Max, and Silicon Mountain Memory.